The original MFIRE is a stand-alone program that runs to completion without pause, based on the input parameters. Because of this, it is difficult to use its ventilation and fire modeling capabilities within larger simulation projects as it is not possible to collect and process intermediate results. 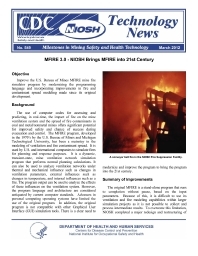 To overcome this limitation, NIOSH completed a major redesign and restructuring of MFIRE. The program was split into a front-end with a simple graphical-user-interface (GUI), and the MFIRE "engine" back-end. MFIRE 3.0 was rewritten as a discrete event simulation library so it can be used to simulate the progress of mine fires over time, under the control of user inputs through the GUI. MFIRE’s outdated programming language was replaced with an object-oriented C++ approach for ease of future maintenance. A key aspect of the redesign was that third party developers can obtain ventilation network data from the common memory rather than the default MFIRE data output files. This allows developers to use their GUI’s to display the progression of changes to the mine ventilation network. Finally, other improvements to MFIRE were made to increase the size of mine ventilation networks that can be modeled, improve capture and processing of runtime errors, add the ability to report results in both imperial and metric measurement units, and to utilize more user-friendly names for data structures.